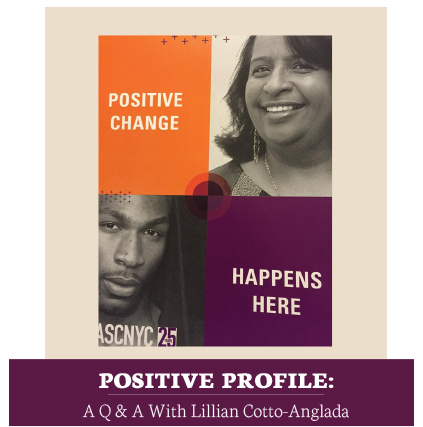 Lillian Cotto-Anglada is a long-term HIV warrior. She's a native New Yorker who has been living with HIV for 31years. Over her years educating and advocating, especially for women, she's won several awards and earned much recognition for her efforts. Today, she's the President of the Consumer Advisory Council at The Alliance for Positive Change in New York City, which allows her to participate in the nonprofit’s decision-making and ensure better quality of life for clients. She is particularly involved in combating the stigma that’s associated with HIV/AIDS in the Hispanic/Latino communities. We had the opportunity to catch up with Lillian and ask her some questions about living with HIV and to offer advice for others. Q: Tell us a little about you and your past. A: I'll be 59 on October 9th. I'm a Latina of Puerto Rican descent, born in New York, and proud of my heritage and my family's traditions. I had my daughter when I was 17, and after getting my GED, I worked as a Field Customer Representative for Con Edison. Q: Do you know how youwere infected? A: It was sexually transmitted in 1986. My husband was in the hospital with PCP pneumonia and he knew he had AIDS. Three years later, in 1989, I learned I was HIV-positive. When people ask, "How were you infected?” I respond, "Because I did not have the proper information and education." Q: Tell me about your diagnosis. A: I was infected in 1986 and diagnosed in 1989. The doctor told me I'd have two years to live. Here I am today, by the grace of God. Q: How and when did you let others know your status? A: After two years, when my husband died, I told everyone, "Accept me as I am or leave my life." Nobody left. I have a real big support system. Q: Has being HIV-positive helped you in any way? A: This is what living with HIV has taught me: HIV changes quickly, and as such, I quickly learn how to change. I stay informed so I can fight it better. I will always be grateful to my family, friends, and co-workers at The Alliance for Positive Change and other community-based organizations. They have supported me through this process, and thanks to them, I have been able to do my life affirming events, like Mother's Day of Pampering, serving 50-to-100 mothers and daughters, and assisting with the Annual Dinner Dance and Christmas Dinner Dance at the Alliance, serving around 400 clients and peers. I am happy to say that after 31 years, being HIV-positive helped me make a positive change in my life. In fact, in some way, becoming HIV-positive is one of the best things that ever happened to me. I always wanted to die, so I received a gift that took me to fight for my life--lesson learned! I'm not sure I would have said that when I first had to face living with HIV. I have met a completely new family within the HIV-positive community, and that would never have been possible otherwise. Q: What would your advice be to the newly diagnosed? A: Today I want to live! I have learned so much from other people. I have learned that everyone's life is different but often we encounter similar obstacles. We learn to adapt. To find a solution for all situations, I got involved in this struggle, and this has given me the capacity to continue to fight. I have first-hand experience and I share my story to educate others. I also learn from the responses I receive from my peers, and I apply those responses to my life. Q: What are you looking forward to or what would you like to see happen? A: I want to see a cure for our new generation, not for me. I would also like to see more funding for heterosexual women, but the statistics show us as non-existent on the charts. There needs to be more assistance for us and our families. Q: What do you enjoy doing these days? A: Doing for others instead of me. I am determined to get healthier and educate myself about new facts with living with HIV. I also enjoy reading, Spanish food, and being with my grandchildren. The Alliance for Positive Change transforms lives of New Yorkers living with HIV/AIDS and other chronic illnesses. They help people access medical care, manage and overcome addiction, escape homelessness, get back to work and find a sense of community. Today the Alliance has grown to become a leader in innovative, culturally competent HIV/AIDS services to ensure that all New Yorkers have access to HIV testing, treatment, care and support. Each year, they help more than 14,000 New Yorkers feel better, and do better. For more information and a listing of services and locations, please visit http://alliance.nyc/.